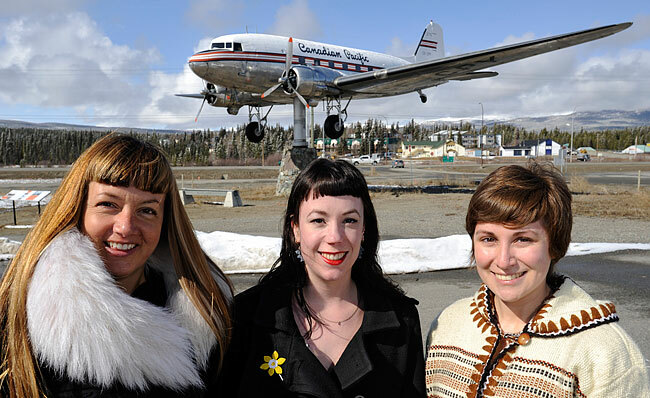 The Yarn Bomb Yukon Collective is currently made up of Jessica Vellenga, coordinator and Bree-An Lucas assistant coordinator and a lot of amazing local volunteers and crafters who help build and contribute to our projects. 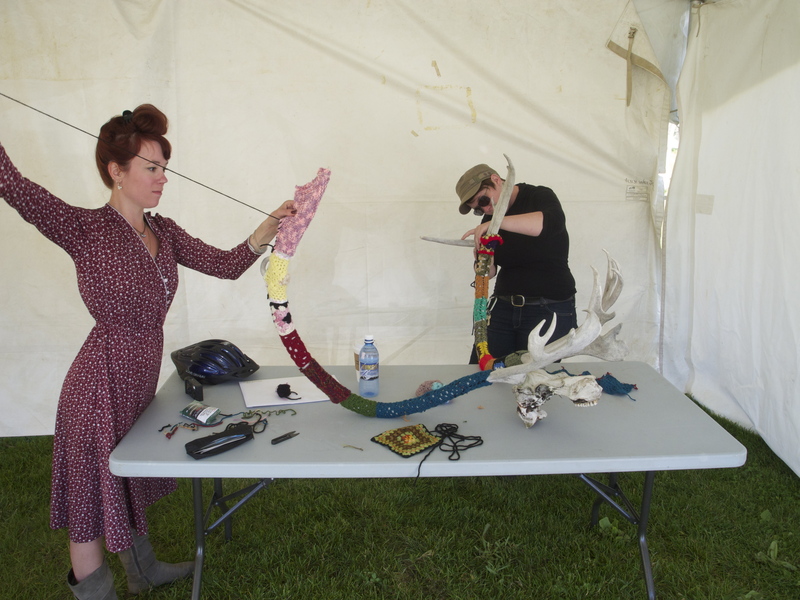 The YBY Collective actively promotes fibre arts through yarn bombing inanimate objects and offering workshops on fibre arts and yarn bombing to the public. We are based out of Whitehorse, Yukon. Jessica is an artist whose practice is grounded in craftivism (combining the genres of craft, art and activism) and community engagement. Jessica primarily works as a textile artist and emerging fashion and accessory designer. She is the coordinator of Yarn Bomb Yukon Collective, a fibre arts collective which creates large scale community based art projects through the medium of yarn bombing. 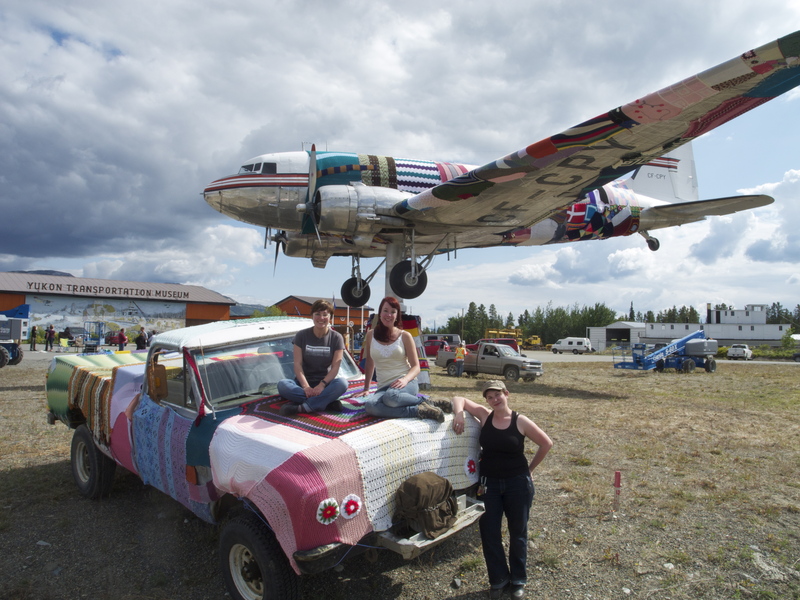 Her latest project with Yarn Bomb Yukon was coordinating the Knitting for History: Yarn Bombing the DC-3 project, which became Canada’s largest yarn bomb. Her previous large scale community engagement projects have been Dear Diary Series, Surface Tension and Emotional Baggage. Amber is a mixed media artist, painter, installation artist, and designer who has called Yukon home for most of her life. She draws inspiration for her work from the natural world, social justice and environmental movements, history, mythology and fairy tales, and her imagination. When she isn’t working in her studio she can be found trying to save the world; teaching at Yukon College; haunting the backstage of theatres, or playing outside. Although her past has taken her from United Nations Climate Change negotiations, to skiing and snowboarding course crews for the Olympics, and to teaching in Antarctica, she finds herself most content when she is mucking about in her studio with her puppy in a bit of sunshine. Bree has been pursuing her love of the textile arts since childhood when her father first showed her how to make a knit stitch. Since then she has enjoyed building her skill set to include sewing, embroidery and crochet as well as knitting. It is important to Bree to promote the textile arts as valid form of self expression rather than something that is relegated to a ‘women’s area’. She believes that textiles are beautiful, fierce, radical and can be very loud. She also believes that they can be for everyone and should be made accessible to all interested, which is why she is excited to be part of the Yarn Bomb Yukon Collective. Bree is originally from Northern Ontario but has settled in the Yukon, and she enjoys all things outdoors (including knitting). Originally from Haines Junction, Casey Lee is a part-time muse, a full-time friend and the curator of the Yukon Transportation. As a fierce lover of art, her diverse influences range from costume designer Edith Head to painter Frida Kahlo. For Casey Lee yarn bombing is an opportunity to add both beauty and mischief to the world, both of which she believes we need more of. When not on a bombing raid, she enjoys hiking, biking, and the occasional glass of pinot noir. She is also the founding member of the East Vancouver Poultry Rescue Squad. As an architect, Mary Ellen has worked on a wide variety of projects including institutional, commercial and residential work. She has over fourteen years of practical experience in building design and project management in major cities across the Pacific Northwest. As principal of Northern Front Studio, Mary Ellen was the architect for the 22 Waterfront Senior’s Housing Project, the Yukon College Addition to SOVA in Dawson, Waterfront Station, Tetra Tech EBA Lab & Offices, and Bethany Church Addition. She is currently overseeing the construction administration for NVD Centre, and 207 Alexander Senior’s Apartments. Charlie’s Angels of Yarn Bombing!